This article, found on the Friends of the Colorado Monument website, brings attention to the downside of big crowds drawn to high-visibility, historically famous national parks. Those crowds, combined with quick fame via social media postings, have created a new vulnerability to our national protected areas that neither the National Park Service nor Mother Nature are prepared to deal with. As National Parks become more visible, the temptation by social media “celebrity vandals” to destroy their features becomes greater. In recent years numerous national parks have suffered a surge in vandalism, thanks to increased visibility and social media. In nearby Arches National Park, according to an April 11, 2014 article in the Salt Lake Tribune, the Sand Dunes Ranch section had to be closed from public access because of heavy vandalism to its sandstone boulders and cliffs. Rangers described the 20 by 30 ft section of sandstone wall as “deeply etched with graffiti” and said that the degree of destruction was surprising since this section of the park is “tucked away,” off the beaten path. This recent case in Arches, just across the Utah border from Mesa County, appears to be part of a growing trend in which vandals take pictures of their their destructive activities and post them to social media sites such as Facebook, Twitter, and Instagram. Joshua Tree National Park, popular among residents of Southern California, Western Arizona, and Southern Nevada, is beginning to look like an extension of some graffiti-covered urban centers. In 2013 hundreds of acres and miles of trails traversing Joshua Tree’s giant bounders and unusual vegetation had to be closed due to an outbreak of graffiti vandalism. 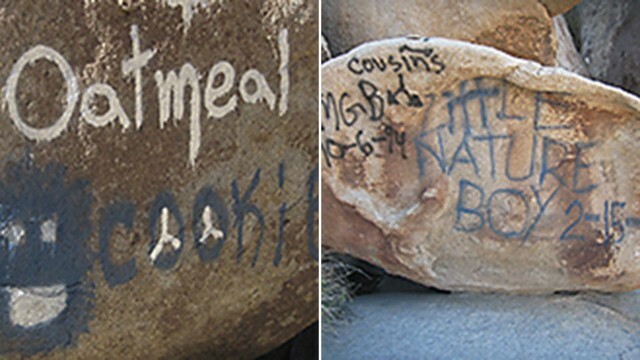 Boulders and some trees were damaged, mostly by spray paint, some scrawled with indecipherable messages and gang tags. Again, accounts point to vandals taking pride in causing damage to a highly prized national parks, and subsequently posting “trophy” images or videos on social media. In September of 2013 the National Parks Service reported on an alarming trend in park vandalism that has resulted in at least 9,000 instances of vandalism within national parks since 2009. In some areas this trend appears to be fueled by “competition” between self-titled graffiti artists, but the “viral” nature of social media postings of defaced national park features is enticing many to become “celebrity” vandals. Social media, however, is not the only driver behind vandalism at national parks. Just weeks ago in March, a 190-million-year-old fossilized dinosaur track was chipped from its sandstone matrix in Canyonlands National Park, and stolen. The vandalism was very likely the result of treasure seeking. Are the costs of higher visibility worth in to those of us who live near the Colorado National Monument? Proponents tout higher visitor numbers and more cash in the local economy, and those points are disputable, but it’s indisputable that the more visible and renowned the national park, the more likely it is to be hit with vandalism by someone seeking 15 minutes of Instagram fame.